I took this picture in Rawlins, Wyoming over the Memorial Day weekend. The entire rig, from tip to tail, must have been 120 feet long. There were two trucks and two escorts parked in the back corner of the truck stop lot. Moves requiring escorts shall not be permitted to travel from one-half hour after sunset the evening before a holiday until one-half hour before sunrise the day after the holiday. When a holiday is combined with a weekend for a 3 day weekend, these restrictions shall be in force from one-half hour after sunset the day proceeding the holiday weekend until one-half hour before sunrise the day following the holiday weekend. When a holiday falls on a Saturday, no move requiring escorts shall be permitted from one-half hour after sunset Thursday until one-half hour before sunrise Monday. When a holiday falls on a Sunday, no move requiring escorts shall be permitted from one-half hour after sunset Friday until one-half hour before sunrise Tuesday. Permits requiring escorts during holiday weekends or as determined by the Overweight Loads Office may exceed four days." 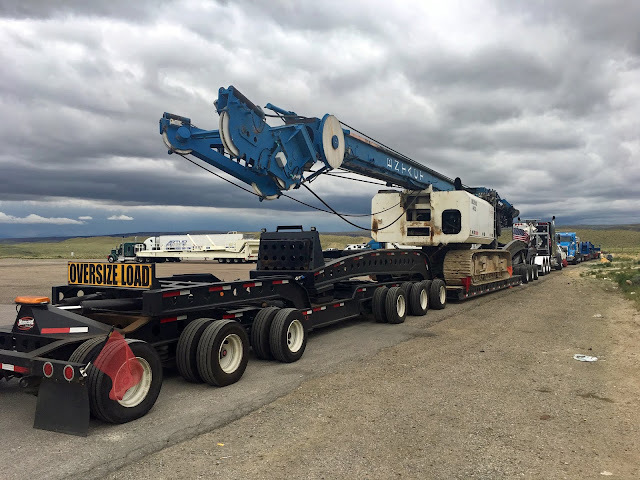 We've never hauled anything that would put us at 120-feet in length, but we've hauled several over-width loads and when doing so, were required to obtain permits in each state of travel and abide by their hours of travel. Which is how we got stuck for an entire weekend at a rest area in Nowheresville, Pennsylvania that didn't have a lick of internet. 2011: I Gave The Tattooed Behive A Chance And I Liked It!